Years ago, someone donated a series of self-help type books that taught life lessons through that cuddle ball of fluff – Winnie the Pooh. I happened to be sorting through my flash-drive when I found this – I vaguely remember typing it up way back when, but I can’t remember why. Perhaps it was for a different social media post? 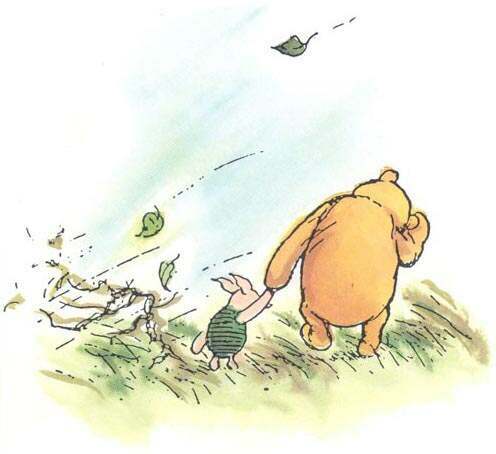 In any case, I believe it was called Pooh’s Little Instruction Book, by A.A. Milne, Ernest H. Shepard (Illustrations). Adorable little book and I’d love to have the whole series again, as I never got a chance to read them all the way through. ~When speaking to a Bear of Very Little Brain, remember that long words may bother him. ~When carrying a jar of honey to give to a friend for his birthday, don’t stop and eat it along the way. ~Don’t forget that a tail is a tail; it isn’t just a Little Bit Extra at the back. ~When you see someone putting on his Big Boots, you can be pretty sure that an adventure is going to happen. ~Despite their claims to the contrary, Tigger’s don’t really like everything. ~Drinking your milk while talking at the same time may result in your having to be patted on the back and dried for quite a long time afterwards. ~Rivers know this; there is no hurry. We shall get there some day. ~A little Consideration, a little Thought for Others, makes all the difference. ~Always watch where you are going, otherwise, you may step on a piece of the Forest that was left out by mistake. ~Never go indoors to practice a special Outdoor Song which has to Be Sung in the Snow. ~Try not to sit down on thistles; it takes all the Life out of them. Besides, someone might have planned on eating them for lunch. ~When looking at your two paws, as soon as you have decided which of them is the right one; then you can be sure that the other is the left. ~The trick to succeeding in Poohsticks is letting your stick drop in a twitchy sort of way. ~To the uneducated, an A is just three sticks. ~If you secretly get into a kangaroo’s pocket and she begins to jump away, be prepared for a bumpy ride. ~The best place to dig a Very Deep Pit in which to catch a Heffalump is somewhere where a Heffalump is…only about a foot further on. ~When having a smackeral of something with a friend, don’t eat so much that you get stuck in the doorway trying to get out. ~A Proper Tea is much nicer than a Very Nearly Tea, which is one that you forgot about afterwards. ~When late morning rolls around and you’re feeling a bit out of sorts, don’t worry; you’re probably just a little eleven o’clockish. ~Just because and animal is large, it doesn’t mean he doesn’t want kindness; however big Tigger seems to be, remember that he wants as much kindness as Roo. ~When you are a Bear of Very Little Brain, and you Think of Things, you find sometimes that a Thing which seemed very Thingish inside you is quite different when it gets out into the open and had other people looking at it. ~If you plant an Acorn, it will grow up into an oak-tree. But it doesn’t follow that if you plant a honeycomb, it will grow up into a beehive. ~Be especially careful in dangerous places where an Ambush might occur. An Ambush is a sort of Surprise. Then again, so is a gorse-bush sometimes. ~When setting off on an Expedition, be sure to bring Provisions. Or, at very least, things to eat. ~When going around a spinney of larch trees Tracking Something, be sure it isn’t your own footprints you are following. ~When conversing with Owls, remember that they think it is rather beneath them to talk about little cake things with pink sugar frosting. ~When you go after honey with a balloon, the great thing is not to let the bees know you are coming. 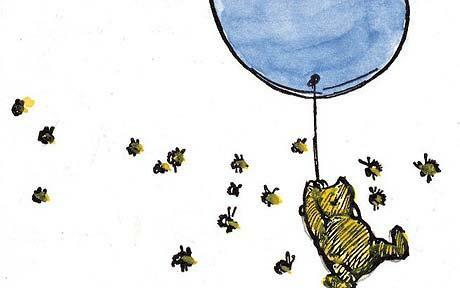 ~Before floating up into the sky with a balloon in search of honey, make sure the bees you are looking for are the right sort of bees. ~Something about the way Very Bouncy Animals say How-do-you-do tends to leave one’s ears full of sand. ~People who don’t Think probably don’t have Brains; rather they have grey fluff that’s blown into their heads by mistake. ~When waking in the morning, remember that whether you’re first though is ‘What’s for breakfast’ or ‘I wonder what’s going to happen exciting today’ it’s the same thing. ~Brains first the Hard Work. ~When selecting a new bell-rope for your front door, make sure it isn’t someone else’s tail. ~When you are pretty sure that an Adventure is going to happen, brush the honey off your nose and spruce yourself up the best you can, so as to look Ready for Anything. ~Nobody can be un-cheered with a balloon. ~When in doubt, keep in mind that “O gallant Piglet” is always a very thoughtful way of beginning a piece of poetry. ~It isn’t much good having anything exciting like flood, if you can’t share them with somebody. ~If the person you are talking to doesn’t appear to be listening, be patient. It may simply be that he has a small piece of fluff in his ear. ~When climbing up a tree on the back of a Tigger, be sure to find out before you start if the Tigger knows how to climb down. ~When someone you love is wedged in a doorway and must wait to get thin enough to get out, read him a Sustaining Book, such as would help and comfort him. ~When searching for someone, it’s a good idea to determine whether the missing person is the sort of friend-and-relation who settles on one’s nose, or the sort who might be trodden on by mistake. ~You can’t stay in your corner of the Forest waiting for others to come to you. You have to go to them sometimes. ~When your house looks like a tree that has blown down, it is time to get a new house. ~When you fall on someone, it’s not enough to say you didn’t mean to; after all, he probably didn’t mean to be underneath you. ~If you look round and see a Very Fierce Heffalump looking down at you, sometimes you forget what you were going to say. ~Before beginning a Hunt, it is wise to ask someone what you are looking for before you begin looking for it. ~If you’ve eaten the honey that was meant as a birthday gift for a friend, just wash out the pot, get somebody to write “A Happy Birthday” on it, and present the pot as a gift. ~Sometimes a boat is a boat, and sometimes it’s more of an Accident. It depends on whether you’re on the top of it or underneath it. ~If you are looking for Home and find instead a sand-pit, try looking for a sand-pit. Then you’d be sure not to find it, which would be a Good Thing because you might find something that you weren’t looking for, which might be just what you were looking for. ~Even though eating honey is a very good thing to do, there is a moment just before you begin to eat it which is better. ~Drop in on anyone, at any time, if you feel like it. If they say ‘Bother’ you can drop out again. ~Those who are clever, who have a Brain, never understand anything. ~Sometimes, if you stand on the bottom rail of a bridge and lean over to watch the river slipping slowly away beneath you, you will suddenly know everything there is to be known. ~In case of Sudden and Temporary Immersion the Important Thing is to keep the Head Above Water. ~Tigger’s can climb trees. Of course, there’s the coming down, too, which is difficult, unless one falls, in which case it is…easy. ~A bear, however hard he tries, Grows tubby without exercise. ~Poetry and Hums aren’t things which you get, they’re things which get you. And all you can do is go where they can find you. ~When someone gives you a bath that you really don’t want, one which changes your color, remember that you can roll in the dirt on the way home and get your nice comfortable color again. ~If you’re standing on a slippery bank of a river, be careful, if somebody suddenly bounces you loudly from behind, you’ll probably slip. ~If you think you see a Heffalump in a trap, make sure it isn’t really a Bear with an empty jar of honey stuck on his head. ~If you are trying to find your way home, and keep finding yourself instead back at the same sand-pit, it may be that the sand-pit is following you about. ~When making and expedition to discover the North Pole, be sure someone in the group knows what the North Pole looks like. (It’s sure to be a pole stuck into he ground). ~Don’t underestimate the value of Doing Nothing, of just going along, listening to all the things you can’t hear, and not bothering.